KIEV, Ukraine — Fighting in eastern Ukraine between government troops and Russian-backed separatist forces has ground almost to halt. Workers decorate a New Year tree, in front of the St. Sophia Cathedral in central Kiev, Ukraine, Monday, Dec. 15, 2014. 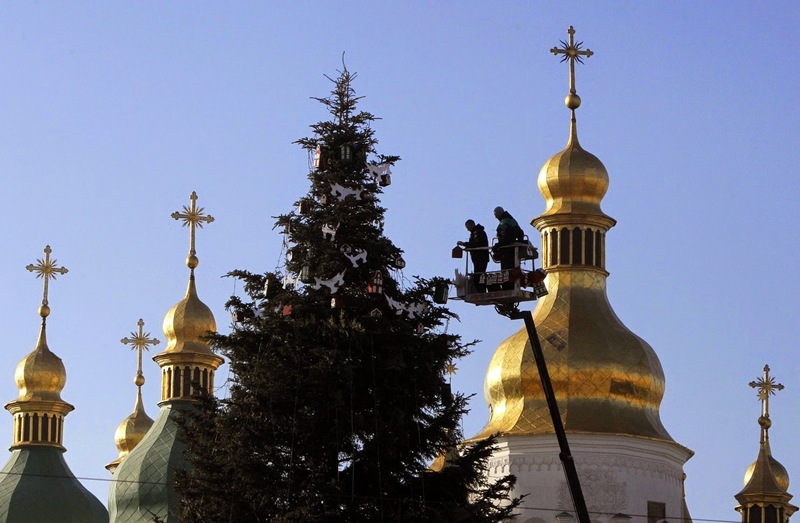 New Year is widely celebrated as the most popular holiday in Ukraine with the Orhodox Christmas being celebrated on Jan. 7. That should be good news for Ukraine, but Russia looks intent to pile on the economic misery. In a detailed op-ed piece Monday, Russian Prime Minister Dmitry Medvedev painted a grim forecast of Russian economic blockades ahead as Ukraine embarks on closer integration with Europe. “The Ukrainian government has made its choice. And even if our neighbors have a poor understanding of the ultimate price they will have to pay, that is their right,” Medvedev said. Those ominous words came as a renewed truce in east Ukraine called for by President Petro Poroshenko is holding — barring sporadic violations — since it began last week. More than 4,700 people have been killed since the conflict broke out in mid-April, U.N. rights investigators estimate — and more than a quarter of those deaths came after a cease-fire in September that was routinely ignored. Ukrainian authorities are hopeful, saying more peace talks are on the horizon. The intensity of attacks on government-held areas has reduced notably and is now limited to mortar and small arms fire, military spokesman Colonel Andriy Lysenko said Monday. Separatists who have often accused government forces of breaking the truce agreed that violence has reduced dramatically. Changes on the ground appear to reflect shifts on the diplomatic front. While supporting the separatists, Moscow has said it accepts the rebellious east should remain part of Ukraine. Russian Foreign Minister Sergey Lavrov told the state news agency RIA-Novosti last week that pro-Russian separatists were prepared to re-enter a “common economic, humanitarian and political space” with Ukraine. That position reflects the Kremlin’s desire to maintain leverage over its neighbor as a means of keeping it from ever joining NATO. Although the separatist leadership in Ukraine’s eastern Donetsk and Luhansk regions publicly deny that they taking orders from Moscow, rebel officials privately concede the Kremlin plays a direct role in their decision-making. Lavrov’s comments suggest an easing of staunch secessionist positions. A few weeks ago, rebel leaders were vowing to expand the territory under their control. But last week, separatists in Luhansk made a show of withdrawing heavy weaponry from the front line. The next expected development is a prisoner exchange, which a senior rebel leader in Donetsk, Alexander Khodakovsky, suggested Monday could begin on Dec. 25. Poroshenko has expressed satisfaction with the reduced carnage. “I positively assess the cease-fire regime. This has enabled the strengthening of Ukrainian positions and resupply of servicemen on the line of defense,” he said. But peace on the military front may serve only as prelude to economic hostility. In his 5,600-word opinion piece Monday in the Moscow-based newspaper Nezavisimaya Gazeta, Medvedev outlined a new “pragmatic” chapter in relations with Ukraine. “In plain Russian, dealing with Ukraine ‘pragmatically’ means giving it no quarter. Russia’s economic approach to Ukraine will get tougher,” Dmitry Trenin, who heads the Carnegie Moscow Center, wrote in a Twitter post. Medvedev wrote that Ukraine has been unhealthily reliant on Moscow for too long; adding that as of last spring, Russian orders from Ukrainian companies were valued at $15 billion, or 8.3 percent of Ukraine’s Gross Domestic Product. “Nobody in Ukraine has explained to us, or themselves, how these orders will be replaced,” he wrote. Ukraine remains heavily dependent on Russian natural gas and industries in eastern Ukraine are still tightly intertwined with those in western Russia. Ukraine has had to go cap in hand to Russia recently for electricity supplies, as its power plants lack enough coal. Medvedev also said a closer eye will be paid to Ukrainian citizens traveling to Russia for work — an ominous suggestion that this economic lifeline could be drastically tightened. Ukrainian officials have put a brave face on those veiled threats. “Everything that was possible to cut off has already been cut off by Russia,” said Valeriy Chaliy, deputy head of the Ukrainian presidential administration. He said Ukraine has been pressing hard to diversify the markets for its exports. “Not all roads lead to Russia,” Chaliy said.